Warranty : One Year . Please contact us via email if you have any questions. 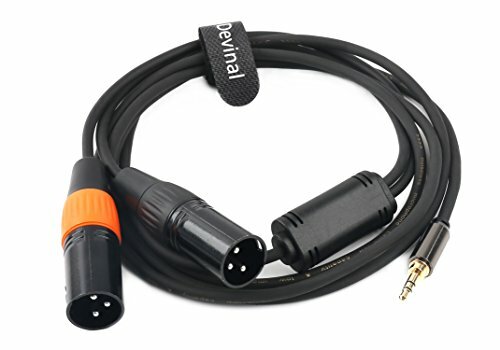 Devinal unbalanced Stereo Audio Y Splitter Cables are designed to connect devices equipped with a 3.5mm (1/8") miniature stereo line-level audio output into devices equipped with dual XLR (left/right) unbalanced inputs. 3.5mm AUX headphone jack to dual XLR stereo audio cable connects an iPhone, iPod, MP3 player, smartphone, tablet, laptop, or voice recorder to a mixing console or powered speakers set with female XLR inputs. Premium Patch cables with metal connectors, Gold contacts and an extremely flexible jacket design that rejects "cable molding"
Heavy Duty Flexible Rubber Jacket. OFC spiral shields for effective EMI and RFI rejection and flexibility. If you have any questions about this product by Devinal, contact us by completing and submitting the form below. If you are looking for a specif part number, please include it with your message.